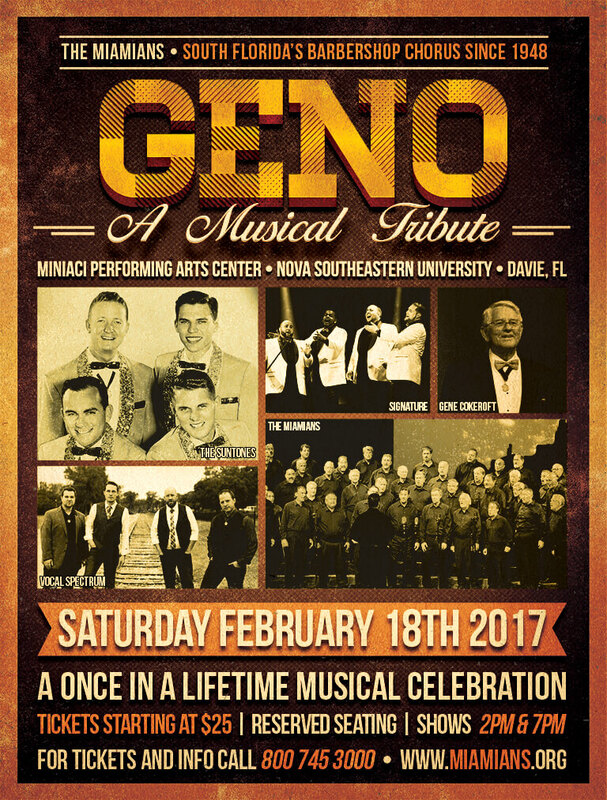 Join us for an amazing musical tribute to our long time musical director and Society-wide barbershop icon Gene Cokeroft. Tickets can be purchased via ticketmaster now! Saturday, February 18th, 2017 at the Rose and Alfred Miniaci Performing Arts Center on the campus of Nova Southeastern University in Davie, FL. The show will feature The Suntones, 1961 International quartet champions (Gene’s quartet) with Bruce Cokeroft, Gene’s son, singing tenor. Vocal Spectrum, 2006 International quartet champions and 2016 4th place international finalists Signature. In addition, the Miamians will be singing a selection of Gene’s arrangement primary custom arranged for the chorus. VIP tickets include a special reception starting one hour prior to each concert on the second floor of the Miniaci theatre with the guest performers and chapter leadership. If you’re interested in supporting the chorus with an advertisement in our show program, please download and follow the instructions on our advertising form. © Copyright 2019 Miami Chapter of the Barbershop Harmony Society.